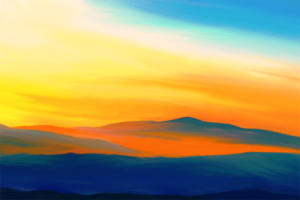 Digital painting of a dramatic landscape in bright colors. Here is another landscape painting that I made with ArtRage. As usual, the sky is very dramatic with bright colors, while the landscape itself is rather simple and minimalist. I have worked with the palette knife tool again, which leads to the beautiful, loose style.